JNN 22 Nov 2014 Sanaa : Yemen’s Shia Ansarullah fighters have managed to push Wahabi al-Qaeda Terrorists out of the southwestern strategic town of Rada’. The Ansarullah fighters, who have the support of allied tribesmen, are now in full control of the strategic town, said Ali Qahum, a top member of the Ansarullah movement, on Tuesday. The situation is calm in the town and the al-Qaeda terrorists have escaped to the Yakla district near the city of Ma’rib, he added. 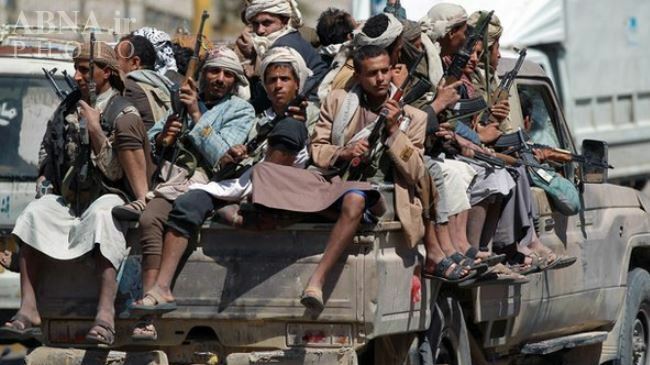 The Ansarullah revolutionaries have also expressed readiness to withdraw from Rada’ in case the Yemeni army is able to restore peace and security to the violence-stricken town. The town had been under the control of al-Qaeda militants since early 2012. Meanwhile, Yemen’s President Abd Rabbuh Mansur Hadi has stressed the need for cooperation with the Shia fighters, also known as Houthis, to restore security to the country. Over the past months, al-Qaeda Terrorists have frequently carried out attacks on Yemen’s security forces and have been also locked in deadly battles with Ansarullah fighters. Yemen’s central government has so far failed to confront the terrorist threat. Ansarullah fighters, however, have intervened to fill the vacuum and driven al-Qaeda Terrorists out of many areas in the country. This entry was posted in Middle East and tagged Al Qaida, Ali Qahum, Ansarullah, Ansarullah fighters, Houthi's, President Abd Rabbuh Mansur Hadi, Re Capture Town, Shia Ansarullah fighters, Wahabi al-Qaeda Terrorists, Yemen, Yemen Shia. Bookmark the permalink. THE SUCCESS OF ANSAAR- ALLAH FROM YEMEN DRIVING AWAY WHAT REMAINED OF AL QAEDAH, ISIS FROM CERTAIN OIL INSTALLATION IN SYRIA, CERTAIN CITIES IN IRAQ SHOULD BE THE BEGINNING OF THE DOOM OF ZIONIST YAHOODI WAHABI INFIDELS HAVING A DREAM OF A REBORN KHILAFAT E UMAYYED, ABBSID & BAKRID . ONLY ALLAH KNOWS AFTER THE SECOND INNINGS OF THE KHALIFAH WHERE THE DRONE HAS DRIV EN HIM THIS TIME . .WE WISH HE HAS REACHED AND HAVING AGALA PARTY UNDER THE GREAT DEPTH OF THE ARABIAN SEA WHERE HIS FOUNDER BOSS HAVE BEEN WAITING . BRAVO ANSARULLAH FIGHTRO ,MAY ALLAH ACCEPT YOUR KARRARI GHAIR FARRARI .